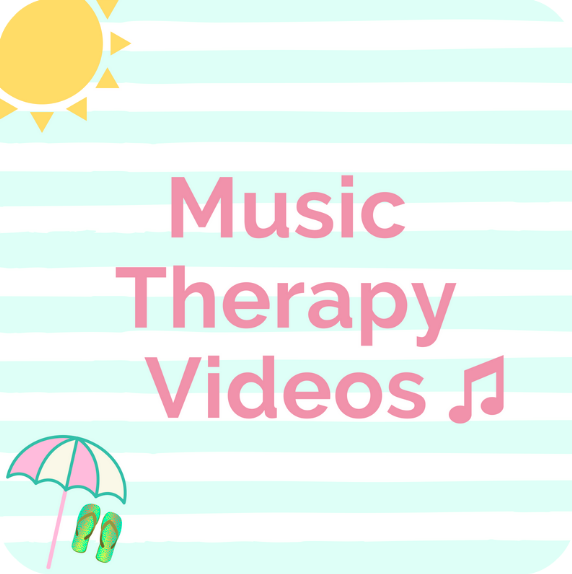 Music Therapy + Cognition Part 1 – Watch this video to see a demonstration of Musical Sensory Orientation Training (MSOT). I’ll be using my clarinet to work on localization skills. Music Therapy + Cognition Part 2 – Watch a demonstration of some Auditory Perception Training (APT) exercises using the guiro, chimes and triangle. Music Therapy + Cognition Part 3 – Watch this video demonstration of a Musical Attention Control Training (MACT) experience. You’ll see how I use two different color scarves, an original song, and my uke to address sustained attention and a bit of alternating attention. Movin’ & Groovin’ in Music Therapy ~ Part 1 – Watch this video to see how I combine music + movement to help my client practice identifying shapes. Movin’ & Groovin’ in Music Therapy ~ Part 2 – Watch this video to see how I allow my client to jump and move to music while we practice identifying – AT words. Movin’ & Groovin’ in Music Therapy ~ Part 3 – Check out some of my original movement songs that will get your kiddos up and moving during your session. Movin’ & Groovin’ in Music Therapy ~ Part 4 – Watch this video to see how I use my clarinet to cue movement around the room. Cupcakes + Music + Math = A Winning Combination – See how music therapy can address math goals from the IEP. Book ‘n Song: “Nightsong” – Watch this video and listen to the musical score I composed to match what was happening in the book – Reading Rainbow style. Playing a Rainbow: Color-Coded Notation for Xylophone – See how color-coded notation can facilitate xylophone playing. “How Are You?” ~ A Song About Feelings – This video showcases a song about feelings for kids. Fa, la, la, la, la!! – Watch this video of the children caroling around UCP to spread Christmas cheer! Bringing the Outside Inside for Music Therapy – Watch and see how you can use items from the outdoors in your music therapy sessions. Pod guiros and pod shakers anyone? What is Your Name? Woah! – Rhythmic drumming can prompt speaking of complete sentences. Watch and see! Session Fave #1 – Watch this video to see my first session fave. I use it in my sessions to make things run more smoothly and to work on verbal identification of pictures. Session Fave #2 – Watch this video to see my second session fave. I use it to enhance the quality of the musical presentation in my sessions. Session Fave #3 – Watch this video that showcases my third session fave. You’ll find out what it is and see a video of me co-treating with an occupational therapist. Seven Ways to Enhance Your Songwriting Skills – Do you write original songs? Read this article to improve your songwriting today. Why Music Works in Therapy – Why is music an effective medium for therapy? Read this article to find out. Temple Grandin Lecture: Different Kinds of Minds – Read to find out the “take aways” from Temple Grandin’s lecture on autism. The Journal of Music Therapy Arrived! – Click to find out all the details of my master’s thesis being published in the Journal of Music Therapy…exciting!